Smoothies are my go-to after school snack. Made without ice cream, protein powder, or refined sugar, this all-natural, vegan peanut butter banana smoothie is a favorite in my family. It’s a great smoothie for kids and picky eaters looking for easy and delicious whole food nutrition. When I pick my kids up from a long day at school they are hot and hungry. I’ve learned to give them a nourishing snack ASAP – before the hangry melt downs begin. My go-to healthy after-school snack has always been the creamy, cold, refreshing, nourishing, ice creamy smoothie. I often bring frosty smoothies with me to school pick-up so the girls can enjoy them on the way home or on the way to whatever after school activity we have planned. Smoothies work well for kids because they are easy to eat and nutrient dense, but taste like an ice cream treat. There are a few different smoothies my girls ask for: dragon fruit, acai, tropical, and peanut butter top their lists. There are a couple of smoothie shops in town that make peanut butter smoothies that taste almost identical to this one, but are made with processed ingredients and loads of sugar. When we opt for a sugary “special treat” out I almost always regret it, as the behavior that ensues shortly afterward is just not worth it. When I made my girls’ smoothies before school pick-up yesterday I realized I hadn’t ever shared their favorite peanut butter banana smoothie with you. Sorry! That had to change immediately. Some smoothie shops thicken and sweeten their delectable smoothies with ice cream, ice milk, or sugar laden frozen yogurt. Don’t let their clever marketing fool you, these are not health foods. I like to make smoothies at home to avoid those filler ingredients. At home, smoothies taste just as wonderful as in the shop, but are made with real food ingredients. The trick to making thick and creamy smoothies is using frozen fruit. I keep a drawer in our freezer stocked with frozen fruit and especially frozen sliced banana so I’m always ready for smoothie making. 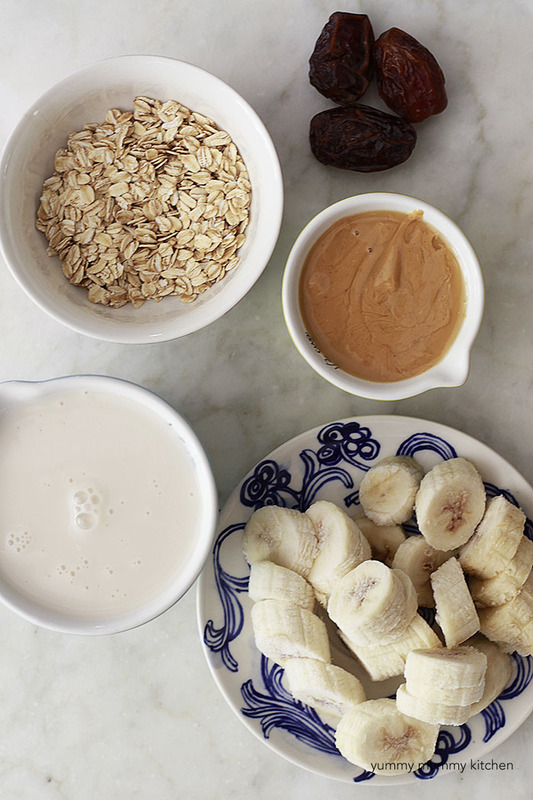 This thick peanut butter banana smoothie is a tasty way to cool down those sweet sweaty kids after school, but it’s also ideal for breakfast topped with granola and fruit. To make this smoothie even more decadent I sometimes blend in a tablespoon of unsweetened cacao powder. In these photos I’ve poured some of the peanut butter banana smoothie into the jars and then continued blending with the cacao powder so there are two flavors. 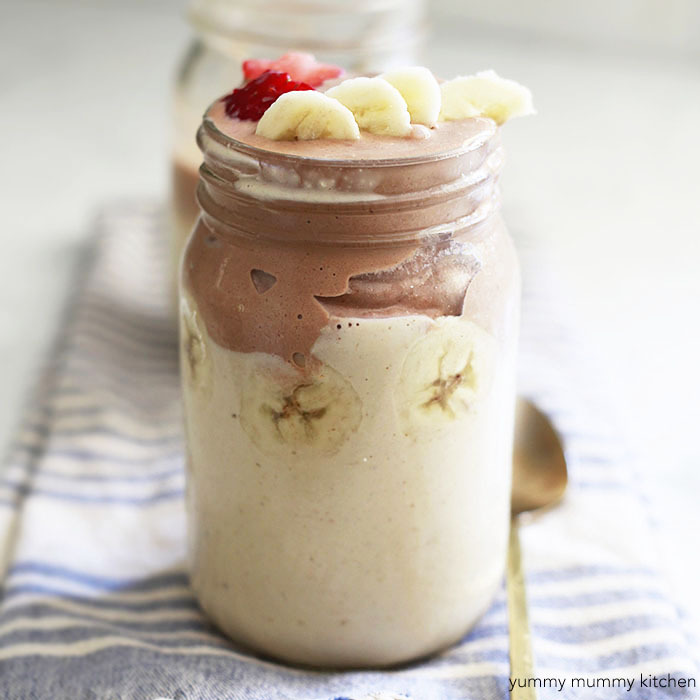 Creamy vegan peanut butter banana smoothie that's perfect for kids and adults alike. Place all ingredients in the blender and blend until smooth and creamy and no chunks of dates remain. Options: *To make this chocolatey, blend in cacao powder. *If you would like this smoothie sweeter, you can add a drizzle of maple syrup to the blender.